Multimedia Kiosks display enticing imagery, which starts the buying journey for passers by. It also creates efficiency by communicating important information to your clients and staff. You can pre-load content from your home office or on the run. Your head office, marketing department or advertising agency can create and load content from wherever they are located. Our clear and bright LCD digital display enables a wide variety of applications for countless businesses and industries. They can be installed in practically any location or public venue, and are ideal for restaurants, retail shops and centres, museums, healthcare facilities, hotels, education, aged care and corporate campuses. We offer great functionality with a combination of top name hardware like Samsung, LG and other well-known brands with A + screen cooperation. We also offer LCD capacitive touch screen touch technology: infrared touch \ PCT \ PCT touch screen. Interactive Kiosks are ideal to use as Way-Finding screens to direct customers and visitors around your site. 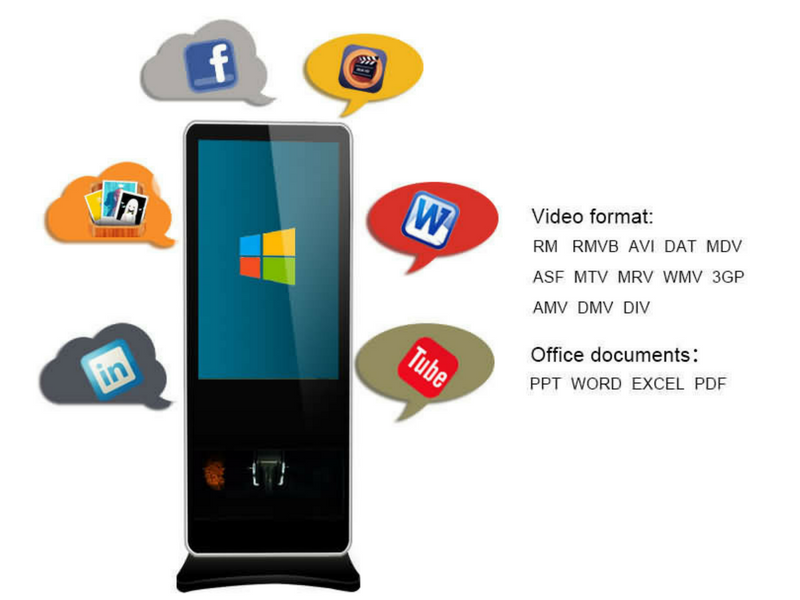 You can create digital content using the easy and flexible display control software. The control software can be a separate dedicated program or internal integrated hardware. New messages can be created from creative lists of music, videos, images, graphics, words and phrases, which are combined in different combinations and permutations to generate new messages in real time.